The new Daytona Tamworth kart circuit opened to popular acclaim last Friday (17 April), with professional drivers and amateurs alike waxing lyrical about the track and its facilities at a star-studded launch and team endurance race prior to its public opening the following day. Daytona Tamworth joins existing venues in Manchester, Milton Keynes and Esher as part of the successful Daytona Motorsport stable. 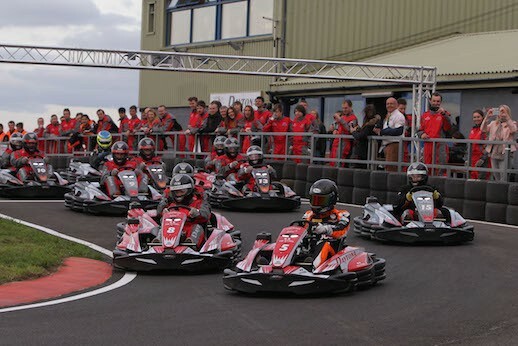 The UK′s leading kart venue operator already attracts in excess of 100,000 leisure and professional drivers annually, aged five and upwards, and the fourth Daytona facility is set to see that number rise yet further. The Mayor of North Warwickshire, Cllr. Ray Sweet, was the guest of honour and cut the ribbon to officially inaugurate the superb new 1,000-metre circuit, ahead of the hour-long Daytona Tamworth Pro-Am Karting Challenge, which pitted almost 50 drivers against one another in a fleet of Sodi RT8 pro-racing karts. 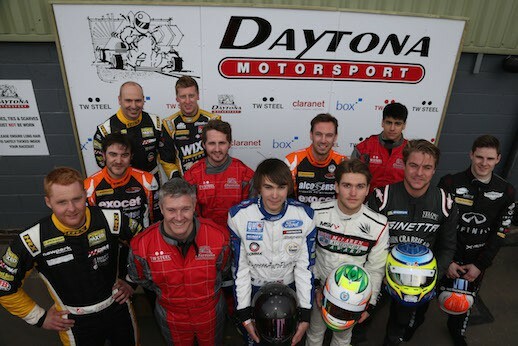 Each of the 12 teams was captained by a professional racing driver, including eight Dunlop MSA British Touring Car Championship stars – Sam Tordoff, Rob Austin, Adam Morgan, Dave Newsham, Hunter Abbott, Josh Cook, Martin Depper and Derek Palmer Jr – in addition to MSA Formula aces Sennan Fielding, Rafael Martins and Jack Butel and former BTCC podium-finisher Jack Clarke. The track action revved into life with practice and qualifying sessions, both of which witnessed a captivating nip-and-tuck duel between Team Fielding and Team Abbott for initial bragging rights. The former ultimately prevailed, but with barely 1.2 seconds blanketing the entire field, a tantalisingly close race was clearly in prospect. Team Abbott sped immediately into the lead as the pole-sitting Team Fielding fell to the back of the pack – five laps down – during an incident-strewn opening stint. As the race progressed, Team Morgan upped the tempo and took the challenge to the early pace-setter, reducing the deficit to a scant four tenths-of-a-second at a quarter-distance. As the scrap for the top spot intensified, a penalty for Team Abbott dropped the erstwhile leader down to sixth, two laps adrift, leaving Team Morgan clear at the top of the timesheets. That order was maintained through to the chequered flag, as Team Morgan triumphed ahead of Team Martins and Team Cook at the end of 58 laps of fast-and-frantic competition. Mention should also go to the delayed Team Fielding, whose team captain – one of last year’s McLaren AUTOSPORT BRDC Award finalists – earned himself a legion of fans as he fought back brilliantly to seventh, lowering the lap record time and again. The 19-year-old demonstrated the durability of the tyres as he set a new benchmark of 59.072s close to the end, reclaiming three laps along the way to round off a thrilling official opening for Daytona Tamworth. “We’re absolutely over-the-moon with how it went,” enthused Daytona Motorsport Director Jim Graham. “It’s taken a year’s hard graft to get to this point, and I need to say a massive ‘thank you’ to everybody behind-the-scenes here at Daytona Tamworth; they’ve all done a superb job to get this place ready. The team is entirely new and all local people, and they’ve settled in seamlessly.